1/19/2017: Dr. Gimmler presented for the Tarrant County VMA in Fort Worth, TX. 1/27/2017: Dr. Crow presented for the Oklahoma VMA meeting in Norman, OK.
Micah Joy Seals: An aspiring veterinarian visited ADRC for a day. 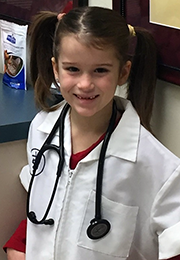 This kindergartner demonstrated hard work and curiosity for the science of veterinary dermatology. We want to wish Micah Joy well in her future aspirations.